Top Israeli officials are visiting France in a last-minute effort to discuss and “amend loopholes” in the nuclear deal with Iran, which Tel Aviv sees as dangerous. It follows reported disagreements between the US and France around negotiating strategy. “This is an effort to prevent a [nuclear] deal that is bad and full of loopholes, or at least... to succeed in closing or amending some of these loopholes,” Israeli International Relations Minister Yuval Steinitz told Israel Radio. Steinitz is visiting Paris with National Security Council head Yossi Cohen and several other intelligence officials. The delegation could also be visiting other European capitals, according to The Jerusalem Post. Steinitz told AP on Monday that discussions with France over Iran’s nuclear program have “proven...productive” in the past, which is why Israel is pursuing its trip to Paris. Over the weekend, there were reports of some disagreements between France and the US, with the former adopting a tougher stance during the negotiations. French Foreign Minister Laurent Fabius called his team in Switzerland to make sure no more concessions were made, officials present at the Iran nuclear talks said last week. Fabius said on Saturday that France wants a deal that would ensure Iran could not produce a nuclear weapon. The Iran nuclear talks include the P5+1 powers – China, France, Russia, the UK, and the US, plus Germany. They are aimed at resolving the long-running dispute over Iran’s nuclear program. The parties suspended talks in Switzerland on Friday, which are scheduled to be resume next week. Those involved in the negotiations still need to resolve the deadlock around Iran’s atomic research and sanctions before the March 31 framework deadline. The full agreement deadline is set for June 30. Another French diplomat also told Reuters that Israel has “gone too far” and “marginalized itself” with its latest moves against the nuclear deal. “We told them to play their part so they could influence a final accord, but they have taken unrealistic positions,” the diplomat said on condition of anonymity. There has been a long-standing rift between Israel and the US on the issue of Iran nuclear talks. The disagreement was further intensified after Israeli PM Benjamin Netanyahu’s controversial speech to the US Congress earlier in March. We have to pay attention to what happens in and with Israel because God's clock works around these events! Israeli Prime Minister Benjamin Netanyahu gave a controversial speech before a joint session of the U.S. Congress on Tuesday where he urged the U.S. not to agree with Iran on a nuclear deal and compared Tehran to the Islamic State militant group. Netanyahu said a potential agreement between the U.S. and Iran would be a “very bad deal,” arguing that Tehran can’t be trusted to pursue nuclear technology for peaceful purposes. But I know it, and I will always be grateful to President Obama for that support. And Israel is grateful to you, the American Congress, for your support, for supporting us in so many ways, especially in generous military assistance and missile defense, including Iron Dome. Last summer, millions of Israelis were protected from thousands of Hamas rockets because this capital dome helped build our Iron Dome. Thank you, America. Thank you for everything you've done for Israel. My friends, I've come here today because, as prime minister of Israel, I feel a profound obligation to speak to you about an issue that could well threaten the survival of my country and the future of my people: Iran's quest for nuclear weapons. We're an ancient people. In our nearly 4,000 years of history, many have tried repeatedly to destroy the Jewish people. Tomorrow night, on the Jewish holiday of Purim, we'll read the Book of Esther. We'll read of a powerful Persian viceroy named Haman, who plotted to destroy the Jewish people some 2,500 years ago. But a courageous Jewish woman, Queen Esther, exposed the plot and gave for the Jewish people the right to defend themselves against their enemies. The plot was foiled. Our people were saved. Today the Jewish people face another attempt by yet another Persian potentate to destroy us. Iran's Supreme Leader Ayatollah Khamenei spews the oldest hatred, the oldest hatred of anti-Semitism with the newest technology. He tweets that Israel must be annihilated -- he tweets. You know, in Iran, there isn't exactly free Internet. But he tweets in English that Israel must be destroyed. For those who believe that Iran threatens the Jewish state, but not the Jewish people, listen to Hassan Nasrallah, the leader of Hezbollah, Iran's chief terrorist proxy. He said: If all the Jews gather in Israel, it will save us the trouble of chasing them down around the world. But Iran's regime is not merely a Jewish problem, any more than the Nazi regime was merely a Jewish problem. The 6 million Jews murdered by the Nazis were but a fraction of the 60 million people killed in World War II. So, too, Iran's regime poses a grave threat, not only to Israel, but also the peace of the entire world. To understand just how dangerous Iran would be with nuclear weapons, we must fully understand the nature of the regime. The people of Iran are very talented people. They're heirs to one of the world's great civilizations. But in 1979, they were hijacked by religious zealots -- religious zealots who imposed on them immediately a dark and brutal dictatorship. That year, the zealots drafted a constitution, a new one for Iran. It directed the revolutionary guards not only to protect Iran's borders, but also to fulfill the ideological mission of jihad. The regime's founder, Ayatollah Khomeini, exhorted his followers to "export the revolution throughout the world." I'm standing here in Washington, D.C. and the difference is so stark. America's founding document promises life, liberty and the pursuit of happiness. Iran's founding document pledges death, tyranny, and the pursuit of jihad. And as states are collapsing across the Middle East, Iran is charging into the void to do just that. Iran's goons in Gaza, its lackeys in Lebanon, its revolutionary guards on the Golan Heights are clutching Israel with three tentacles of terror. Backed by Iran, Assad is slaughtering Syrians. Back by Iran, Shiite militias are rampaging through Iraq. Back by Iran, Houthis are seizing control of Yemen, threatening the strategic straits at the mouth of the Red Sea. Along with the Straits of Hormuz, that would give Iran a second choke-point on the world's oil supply. Just last week, near Hormuz, Iran carried out a military exercise blowing up a mock U.S. aircraft carrier. That's just last week, while they're having nuclear talks with the United States. But unfortunately, for the last 36 years, Iran's attacks against the United States have been anything but mock. And the targets have been all too real. Iran took dozens of Americans hostage in Tehran, murdered hundreds of American soldiers, Marines, in Beirut, and was responsible for killing and maiming thousands of American service men and women in Iraq and Afghanistan. Beyond the Middle East, Iran attacks America and its allies through its global terror network. It blew up the Jewish community center and the Israeli embassy in Buenos Aires. It helped Al Qaida bomb U.S. embassies in Africa. It even attempted to assassinate the Saudi ambassador, right here in Washington, D.C. In the Middle East, Iran now dominates four Arab capitals, Baghdad, Damascus, Beirut and Sanaa. And if Iran's aggression is left unchecked, more will surely follow. So, at a time when many hope that Iran will join the community of nations, Iran is busy gobbling up the nations. We must all stand together to stop Iran's march of conquest, subjugation and terror. Now, two years ago, we were told to give President Rouhani and Foreign Minister Zarif a chance to bring change and moderation to Iran. Some change! Some moderation! Rouhani's government hangs gays, persecutes Christians, jails journalists and executes even more prisoners than before. Last year, the same Zarif who charms Western diplomats laid a wreath at the grave of Imad Mughniyeh. Imad Mughniyeh is the terrorist mastermind who spilled more American blood than any other terrorist besides Osama bin Laden. I'd like to see someone ask him a question about that. Iran's regime is as radical as ever, its cries of "Death to America," that same America that it calls the "Great Satan," as loud as ever. Now, this shouldn't be surprising, because the ideology of Iran's revolutionary regime is deeply rooted in militant Islam, and that's why this regime will always be an enemy of America. Don't be fooled. The battle between Iran and ISIS doesn't turn Iran into a friend of America. Iran and ISIS are competing for the crown of militant Islam. One calls itself the Islamic Republic. The other calls itself the Islamic State. Both want to impose a militant Islamic empire first on the region and then on the entire world. They just disagree among themselves who will be the ruler of that empire. In this deadly game of thrones, there's no place for America or for Israel, no peace for Christians, Jews or Muslims who don't share the Islamist medieval creed, no rights for women, no freedom for anyone. So when it comes to Iran and ISIS, the enemy of your enemy is your enemy. The difference is that ISIS is armed with butcher knives, captured weapons and YouTube, whereas Iran could soon be armed with intercontinental ballistic missiles and nuclear bombs. We must always remember -- I'll say it one more time -- the greatest dangers facing our world is the marriage of militant Islam with nuclear weapons. To defeat ISIS and let Iran get nuclear weapons would be to win the battle, but lose the war. We can't let that happen. But that, my friends, is exactly what could happen, if the deal now being negotiated is accepted by Iran. That deal will not prevent Iran from developing nuclear weapons. It would all but guarantee that Iran gets those weapons, lots of them. Let me explain why. While the final deal has not yet been signed, certain elements of any potential deal are now a matter of public record. You don't need intelligence agencies and secret information to know this. You can Google it. Absent a dramatic change, we know for sure that any deal with Iran will include two major concessions to Iran. The first major concession would leave Iran with a vast nuclear infrastructure, providing it with a short break-out time to the bomb. Break-out time is the time it takes to amass enough weapons-grade uranium or plutonium for a nuclear bomb. According to the deal, not a single nuclear facility would be demolished. Thousands of centrifuges used to enrich uranium would be left spinning. Thousands more would be temporarily disconnected, but not destroyed. Because Iran's nuclear program would be left largely intact, Iran's break-out time would be very short -- about a year by U.S. assessment, even shorter by Israel's. And if -- if Iran's work on advanced centrifuges, faster and faster centrifuges, is not stopped, that break-out time could still be shorter, a lot shorter. True, certain restrictions would be imposed on Iran's nuclear program and Iran's adherence to those restrictions would be supervised by international inspectors. But here's the problem. You see, inspectors document violations; they don't stop them. Inspectors knew when North Korea broke to the bomb, but that didn't stop anything. North Korea turned off the cameras, kicked out the inspectors. Within a few years, it got the bomb. Now, we're warned that within five years North Korea could have an arsenal of 100 nuclear bombs. Like North Korea, Iran, too, has defied international inspectors. It's done that on at least three separate occasions -- 2005, 2006, 2010. Like North Korea, Iran broke the locks, shut off the cameras. Now, I know this is not gonna come a shock -- as a shock to any of you, but Iran not only defies inspectors, it also plays a pretty good game of hide-and-cheat with them. The U.N.'s nuclear watchdog agency, the IAEA, said again yesterday that Iran still refuses to come clean about its military nuclear program. Iran was also caught -- caught twice, not once, twice -- operating secret nuclear facilities in Natanz and Qom, facilities that inspectors didn't even know existed. Right now, Iran could be hiding nuclear facilities that we don't know about, the U.S. and Israel. As the former head of inspections for the IAEA said in 2013, he said, "If there's no undeclared installation today in Iran, it will be the first time in 20 years that it doesn't have one." Iran has proven time and again that it cannot be trusted. And that's why the first major concession is a source of great concern. It leaves Iran with a vast nuclear infrastructure and relies on inspectors to prevent a breakout. That concession creates a real danger that Iran could get to the bomb by violating the deal. But the second major concession creates an even greater danger that Iran could get to the bomb by keeping the deal. Because virtually all the restrictions on Iran's nuclear program will automatically expire in about a decade. Now, a decade may seem like a long time in political life, but it's the blink of an eye in the life of a nation. It's a blink of an eye in the life of our children. We all have a responsibility to consider what will happen when Iran's nuclear capabilities are virtually unrestricted and all the sanctions will have been lifted. Iran would then be free to build a huge nuclear capacity that could product many, many nuclear bombs. Iran's Supreme Leader says that openly. He says, Iran plans to have 190,000 centrifuges, not 6,000 or even the 19,000 that Iran has today, but 10 times that amount -- 190,000 centrifuges enriching uranium. With this massive capacity, Iran could make the fuel for an entire nuclear arsenal and this in a matter of weeks, once it makes that decision. My long-time friend, John Kerry, Secretary of State, confirmed last week that Iran could legitimately possess that massive centrifuge capacity when the deal expires. Now I want you to think about that. The foremost sponsor of global terrorism could be weeks away from having enough enriched uranium for an entire arsenal of nuclear weapons and this with full international legitimacy. And by the way, if Iran's Intercontinental Ballistic Missile program is not part of the deal, and so far, Iran refuses to even put it on the negotiating table. Well, Iran could have the means to deliver that nuclear arsenal to the far-reach corners of the earth, including to every part of the United States. So you see, my friends, this deal has two major concessions: one, leaving Iran with a vast nuclear program and two, lifting the restrictions on that program in about a decade. That's why this deal is so bad. It doesn't block Iran's path to the bomb; it paves Iran's path to the bomb. So why would anyone make this deal? Because they hope that Iran will change for the better in the coming years, or they believe that the alternative to this deal is worse? Well, I disagree. I don't believe that Iran's radical regime will change for the better after this deal. This regime has been in power for 36 years, and its voracious appetite for aggression grows with each passing year. This deal would wet appetite -- would only wet Iran's appetite for more. Would Iran be less aggressive when sanctions are removed and its economy is stronger? If Iran is gobbling up four countries right now while it's under sanctions, how many more countries will Iran devour when sanctions are lifted? Would Iran fund less terrorism when it has mountains of cash with which to fund more terrorism? Why should Iran's radical regime change for the better when it can enjoy the best of both world's: aggression abroad, prosperity at home? This is a question that everyone asks in our region. Israel's neighbors -- Iran's neighbors know that Iran will become even more aggressive and sponsor even more terrorism when its economy is unshackled and it's been given a clear path to the bomb. And many of these neighbors say they'll respond by racing to get nuclear weapons of their own. So this deal won't change Iran for the better; it will only change the Middle East for the worse. A deal that's supposed to prevent nuclear proliferation would instead spark a nuclear arms race in the most dangerous part of the planet. This deal won't be a farewell to arms. It would be a farewell to arms control. And the Middle East would soon be crisscrossed by nuclear tripwires. A region where small skirmishes can trigger big wars would turn into a nuclear tinderbox. If anyone thinks -- if anyone thinks this deal kicks the can down the road, think again. When we get down that road, we'll face a much more dangerous Iran, a Middle East littered with nuclear bombs and a countdown to a potential nuclear nightmare. Ladies and gentlemen, I've come here today to tell you we don't have to bet the security of the world on the hope that Iran will change for the better. We don't have to gamble with our future and with our children's future. We can insist that restrictions on Iran's nuclear program not be lifted for as long as Iran continues its aggression in the region and in the world. Before lifting those restrictions, the world should demand that Iran do three things. First, stop its aggression against its neighbors in the Middle East. Second... Second, stop supporting terrorism around the world. And third, stop threatening to annihilate my country, Israel, the one and only Jewish state. Thank you. If the world powers are not prepared to insist that Iran change its behavior before a deal is signed, at the very least they should insist that Iran change its behavior before a deal expires. If Iran changes its behavior, the restrictions would be lifted. If Iran doesn't change its behavior, the restrictions should not be lifted. If Iran wants to be treated like a normal country, let it act like a normal country. My friends, what about the argument that there's no alternative to this deal, that Iran's nuclear know-how cannot be erased, that its nuclear program is so advanced that the best we can do is delay the inevitable, which is essentially what the proposed deal seeks to do? Well, nuclear know-how without nuclear infrastructure doesn't get you very much. A racecar driver without a car can't drive. A pilot without a plan can't fly. Without thousands of centrifuges, tons of enriched uranium or heavy water facilities, Iran can't make nuclear weapons. Iran's nuclear program can be rolled back well-beyond the current proposal by insisting on a better deal and keeping up the pressure on a very vulnerable regime, especially given the recent collapse in the price of oil. Now, if Iran threatens to walk away from the table -- and this often happens in a Persian bazaar -- call their bluff. They'll be back, because they need the deal a lot more than you do. And by maintaining the pressure on Iran and on those who do business with Iran, you have the power to make them need it even more. ... no country has a greater stake -- no country has a greater stake than Israel in a good deal that peacefully removes this threat. Ladies and gentlemen, history has placed us at a fateful crossroads. We must now choose between two paths. One path leads to a bad deal that will at best curtail Iran's nuclear ambitions for a while, but it will inexorably lead to a nuclear-armed Iran whose unbridled aggression will inevitably lead to war. The second path, however difficult, could lead to a much better deal, that would prevent a nuclear-armed Iran, a nuclearized Middle East and the horrific consequences of both to all of humanity. You don't have to read Robert Frost to know. You have to live life to know that the difficult path is usually the one less traveled, but it will make all the difference for the future of my country, the security of the Middle East and the peace of the world, the peace, we all desire. My friend, standing up to Iran is not easy. Standing up to dark and murderous regimes never is. With us today is Holocaust survivor and Nobel Prize winner Elie Wiesel. Elie, your life and work inspires to give meaning to the words, "never again." And I wish I could promise you, Elie, that the lessons of history have been learned. I can only urge the leaders of the world not to repeat the mistakes of the past. Not to sacrifice the future for the present; not to ignore aggression in the hopes of gaining an illusory peace. But I can guarantee you this, the days when the Jewish people remained passive in the face of genocidal enemies, those days are over. We are no longer scattered among the nations, powerless to defend ourselves. We restored our sovereignty in our ancient home. And the soldiers who defend our home have boundless courage. For the first time in 100 generations, we, the Jewish people, can defend ourselves. This is why -- this is why, as a prime minister of Israel, I can promise you one more thing: Even if Israel has to stand alone, Israel will stand. But I know that Israel does not stand alone. I know that America stands with Israel. I know that you stand with Israel. You stand with Israel, because you know that the story of Israel is not only the story of the Jewish people but of the human spirit that refuses again and again to succumb to history's horrors. Facing me right up there in the gallery, overlooking all of us in this (inaudible) chamber is the image of Moses. Moses led our people from slavery to the gates of the Promised Land. And before the people of Israel entered the land of Israel, Moses gave us a message that has steeled our resolve for thousands of years. I leave you with his message today, (SPEAKING IN HEBREW), "Be strong and resolute, neither fear nor dread them." My friends, may Israel and America always stand together, strong and resolute. May we neither fear nor dread the challenges ahead. May we face the future with confidence, strength and hope. May God bless the state of Israel and may God bless the United States of America. Thank you. Thank you very much. Thank you all. You're wonderful. Thank you, America. Thank you. Thank you. For six years, President Barack Obama and Israeli Prime Minister Benjamin Netanyahu have been on a collision course over how to halt Iran's nuclear ambitions, a high-stakes endeavor both men see as a centerpiece of their legacies. The coming weeks will put the relationship between their countries, which otherwise remain stalwart allies, to one of its toughest tests. Netanyahu is bound for Washington for an address to Congress on Tuesday aimed squarely at derailing Obama's cherished bid for a diplomatic deal with Tehran. At the same time, Secretary of State John Kerry and other international negotiators will be in Switzerland for talks with the Iranians, trying for a framework agreement before a late March deadline. In between are Israel's elections March 17, which have heightened the political overtones of Netanyahu's visit to Washington. The prime minister is speaking to Congress at the request of Republicans. His visit was coordinated without the Obama administration's knowledge, deepening tensions between two leaders who have never shown much affection for each other. Jeremy Ben-Ami, president of the liberal Jewish advocacy group J Street, said Netanyahu was "crossing some lines that haven't been crossed before and is putting Israel into the partisan crossfire in a way it has not been before." But the largest pro-Israel lobby in the U.S., the American Israel Public Affairs Committee, has tried to play down the partisanship. "AIPAC welcomes the prime minister's speech to Congress and we believe that this is a very important address," spokesman Marshall Wittmann said. "We have been actively encouraging senators and representatives to attend and we have received an overwhelmingly positive response from both sides of the aisle." Nearly a dozen Democratic lawmakers plan to sit out Netanyahu's speech, calling it an affront to the president. Stopping Iran from building a nuclear bomb has become a defining challenge for both Obama and Netanyahu, yet one they have approached far differently. For Obama, getting Iran to verifiably prove it is not pursuing nuclear weapons would be a bright spot in a foreign policy arena in which numerous outcomes are uncertain and would validate his early political promise to negotiate with Iran without conditions. Netanyahu considers unacceptable any deal with Iran that doesn't end its nuclear program entirely and opposes the diplomatic pursuit as one that minimizes what he considers an existential threat to Israel. Tehran says its nuclear program is peaceful and exists only to produce energy for civilian use. "Through scaremongering, falsification, propaganda and creating a false atmosphere even inside other countries, (Israel) is attempting to prevent peace," Iran's top nuclear negotiator said Saturday in Tehran. "I believe that these attempts are in vain and should not impede reaching a (nuclear) agreement," said Foreign Minister Mohammad Javad Zarif. U.S. and Iranian officials reported progress in the latest talks on a deal that would freeze Tehran's nuclear program for 10 years, but allow it to slowly ramp up in the final years of the accord. Obama has refused to meet Netanyahu during his visit, with the White House citing its policy of not meeting with foreign leaders soon before their elections. Vice President Joe Biden and Kerry will both be out of the country on trips announced only after Netanyahu accepted the Republicans' offer to speak on Capitol Hill. The prime minister is scheduled to speak Monday at AIPAC's annual policy conference. The Obama administration will be represented at the event by U.N. Ambassador Samantha Power and national security adviser Susan Rice, who criticized Netanyahu's plans to address Congress as "destructive" to the U.S.-Israeli relationship. The Iran dispute has heightened a relationship between the two leaders that has been frosty from the start. They lack any personal chemistry, leaving them with virtually no reservoir of goodwill to get them through their policy disagreements. Within months of taking office, Obama irritated Israel when, in an address to the Arab world, he challenged the legitimacy of Jewish settlements on Palestinian-claimed land and cited the Holocaust as the justification for Israel's existence, not any historical Jewish tie to the land. The White House was furious when Netanyahu's government defied Obama and announced plans to construct new housing units in East Jerusalem while Biden was visiting Israel in 2010. Additional housing plans that year upended U.S. efforts to restart peace talks between the Israelis and Palestinians. The tension between Obama and Netanyahu was laid bare in an unusually public manner during an Oval Office meeting in 2011. In front of a crowd of journalists, the prime minister lectured Obama at length on Israel's history and dismissed the president's conditions for restarting peace talks. Later that year, a microphone caught Obama telling his then-French counterpart in a private conversation that while he may be fed up with Netanyahu, "You are sick of him, but I have to work with him every day." 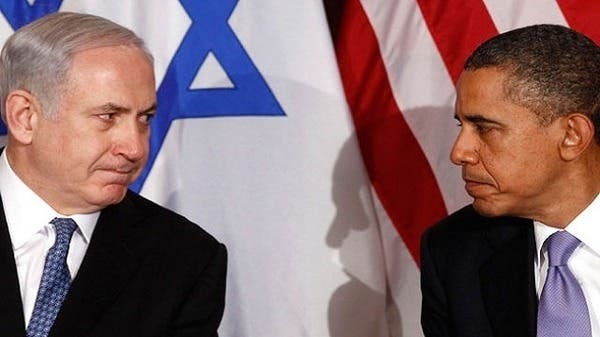 Despite suspecting that Netanyahu was cheering for his rival Mitt Romney in the 2012 presidential campaign, Obama tried to reset relations with the prime minister after his re-election. He made his first trip as president to Israel and the two leaders went to great lengths to put on a happy front, referring to each other by their first names and touring some of the region's holy sites together. The healing period was to be short-lived. Another attempt at Israeli-Palestinian peace talks collapsed. Israeli officials were withering in their criticism of Kerry, who had shepherded the talks, with the country's defense minister calling him "obsessive" and "messianic." The Obama administration returned the favor last summer with its own unusually unsparing criticism of Israel for causing civilian deaths when war broke out in Gaza. The U.S. and Israel have hit rocky patches before. The settlement issue has been a persistent thorn in relations, compounded by profound unhappiness in Washington over Israeli military operations in the Sinai, Iraq and Lebanon during the Ford, Reagan and George H.W. Bush administrations that led those presidents to take or consider direct punitive measures. Yet through it all, the United States has remained Israel's prime benefactor, providing it with $3 billion a year in assistance and defending it from criticism at the United Nations and elsewhere. "We have brought relations back in the past and we will do it again now because at the end of the day they are based on mutual interests," said Dore Gold, a former Israeli ambassador to the United Nations and informal adviser to Netanyahu. "The interests of Israel and the U.S. are similar and sometime identical and I think that is what will determine in the end and not feelings of one kind or another." Israel reportedly bypassed the White House and asked the US Congress for an extra $317 million to be added to President Barack Obama's budget for the next fiscal year in order to fund Israeli missile defense programs, Bloomberg reported. The requested funds would be in addition to the $158 million already proposed by the Pentagon for Israel’s security needs for the fiscal year that will begin on October 1. The new allocation will allegedly finance the 'David's Sling' and 'Arrow-3' programs – designed to intercept medium- to long-range missiles – as well as provide an anti-ballistic missile system. Ramati completely bypassed the White House and the Pentagon. The report links the move to the tense relationship between the Obama administration and the Israeli government ahead of Prime Minister Benjamin Netanyahu’s speech to Congress on March 3, which is likely to stress that the White House is pursuing a “bad deal” by negotiating to curb Iran’s nuclear program. The report revealed that Ramati’s proposal included $250 million to start production of the David’s Sling system, in addition to Obama’s $37 million request for development. Another $35 million Ramati requested for the initial production of Arrow 3, in addition to the $55.7 million the US administration is seeking for development. During his visit to Capitol Hill, Ramati “distributed one-page sheets naming US contractors that would benefit from production funds for each of the missile defense systems.” According to Bloomberg’s information, the list included Chicago-based Boeing Co.; Waltham, Massachusetts-based Raytheon Co.; Arlington, Virginia-based Orbital ATK Inc.; and Falls Church, Virginia-based Northrop Grumman Corp. When contacted by Bloomberg, the Israeli embassy in the US declined to comment on the report. The US already provides Israel with $3.1 billion a year as “foreign military financing,” which excludes other missile defense funds, according to the report. For the current fiscal year, Congress has reportedly provided $620 million, including about $347 million for missile defense programs. US Congress has appropriated more than $1.2 billion since 2011 for the Iron Dome, which is designed to intercept and destroy rockets. In light of the large amounts of distributed funds, US lawmakers have been insisting that Israel use American-based defense contractors when spending the received money. Last year, the Israeli government agreed to spend more than half the funds provided by the Pentagon for the Iron Dome in the US by this year. Until recently, the missile system was been built solely in Israel by Rafael Advanced Defense Systems Ltd.
Iran nuclear talks have created a significant rift between Israel and the US. Last week, the White House and State Department stated that Israel inaccurately provided information and twisted the official US position in nuclear talks with Iran, and accused Tel Aviv of “selectively” leaking details of sensitive talks. Washington has also voiced suspicion that Netanyahu's office directly provided Israeli journalists with the leaked information, including an alleged offer to Iran to keep 6,500 centrifuges for uranium enrichment. A White House spokesman expressed frustration with the “cherry-picked” information released by the Israelis out of context. Netanyahu calls for the Jews of Europe to the mass migration of " Israel "
Called Israeli Prime Minister Benjamin Netanyahu, on Sunday, the Jews of Europe to the mass exodus to " Israel "against the backdrop of attacks Copenhagen , claiming that Tel Aviv is home to every Jew in the world. Netanyahu said at the start of Ministers of Israel Council meeting held this morning, "I hit the terrorism practiced Islam extremist again in Europe, this time in Denmark .. We send our condolences to the Danish people and to the Jewish community in Denmark .. and again been killing Jews Land of Europe just because they are Jews is expected that this wave of terrorist operations will continue It also includes carrying out deadly attacks anti-Semitic character, "he said. "The Jews deserve course protection in any country they live, but we say to our fellow Jews: Israel is your home .. We call to accommodate a mass exodus from Europe and prepare for it .. I would like to say to all the Jews in Europe and the Jews wherever they are: Israel is home to every Jew wherever" . He continued, "we will bring to the cabinet today plan aims to encourage immigration from France, Belgium and Ukraine at a cost of 180 million shekels," he said, adding "we will present later on other plans, and I say to the European Jews and Jews in all throughout the land," and concluded by saying, "Israel awaits you with open arms."